Apple Inc. not only builds some of the most elegant products in the world, but it also masterfully uses technology to enhance the customer experience in its stores. Apple Stores provide three key lessons that business owners in any industry can benefit from. These lessons combine technology with the latest neuroscience research to appeal to the customer's "buying brain." 1. Create multisensory experiences. Every product in an Apple Store is working, loaded with content, and connected to the Internet. Customers are encouraged to touch and play with the products. More than anything -- more than the patented spiral staircase or the iconic glass entrance -- these multisensory experiences are the key to what drives the Apple Store experience. By encouraging customers to experience its products, the Apple Store is satisfying a deep subconscious need. Companies across all categories can increase purchase intent by creating a multisensory context for the shopping experience, says A.K Pradeep who founded Berkeley, Calif.-based NeuroFocus, a neurological testing firm for consumer behavior. The more you engage the senses, the more likely it is that the brain engages with the product or service on an emotional level. This stimulates information retention and the willingness to buy. 2. Educate and entertain. The Apple Store is educational and entertaining. That's the way Steve Jobs wanted it. Jobs and Ron Johnson, the former head of Apple Retail, started with the vision of "enriching lives." Their vision led to the creation of a unique program to help people understand and enjoy their computers: One to One. The $99 one-year membership program is available with the purchase of a Mac. Apple Store instructors, who are called "creatives," offer personalized instruction at the stores. Customers can learn just about anything, from the basics about the Mac operating system to website design. The One to One program was created to help build customers for life. It was designed on the premise that the more you understand a product, the more you enjoy it and the more likely you are to build a long-term relationship with the company. Instructors are trained not only to provide instruction, but also to inspire customers by giving them the tools to become more creative than they ever imagined. If your company can inspire customers to feel better about themselves and their abilities--and to discover abilities they didn't even know they had--they are going to be loyal to your brand and evangelize your products. The Apple Store is fun, too. You might see parents and children learning to create songs together or kids playing games on iMacs in the store's "family room." Pradeep believes the buying brain is engaged through a combination of touch, education and entertainment. "Superior shopping experiences are those that enable consumers to walk away not only having absorbed a lot of information, but having extracted insight that becomes part of an education experience," Pradeep says. "A huge benefit of modern life is also the luxury of being entertained while we shop. This is such a compelling feature of the experience that we seek it out whenever we can. The combination of shopping [which the brain more or less equates with hunting and gathering] and entertainment is enormously powerful." This powerful combination is one that any entrepreneur can replicate with his own customers. 3. Mix high-tech with high-touch. Apple Store employees "showcase the technology." 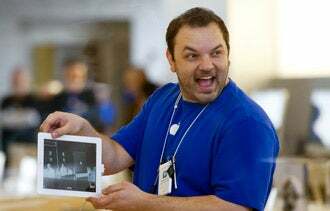 Walk into one of the stores and a friendly employee will check you in with an iPad. The notebook computers are positioned at 90-degree angles, forcing you to touch them to adjust the viewing angle. If you want to learn more about a computer, you will find an iPad nearby containing detailed specs. When it's time to pay for a product, a sales associate will swipe your credit card with a device attached to an iPod Touch. And the Apple Store is experimenting with a new service called Easy Pay that allows customers to use the Apple Store app on their iPhones to pay for purchases and leave the store without speaking to anyone. Easy Pay is designed for customers who want to get in and out in a hurry, but it also creates a deeper connection between customers and Apple's technology and products. Any entrepreneur can create a similar stage to showcase a product or services's best features and help customers appreciate and connect with it. Apple has turned the boring sales floor into a playground for kids and adults. Jobs and Johnson didn't just "reimagine" the retail experience, they blew it up and started from scratch. Ask yourself how you can shake up the customer experience in your own business to surprise and delight your own customers. Showcase your products, educate and entertain your customers, and outsmart your competitors. If you do, customers will take notice, and the shine of Apple will rub off on your company.